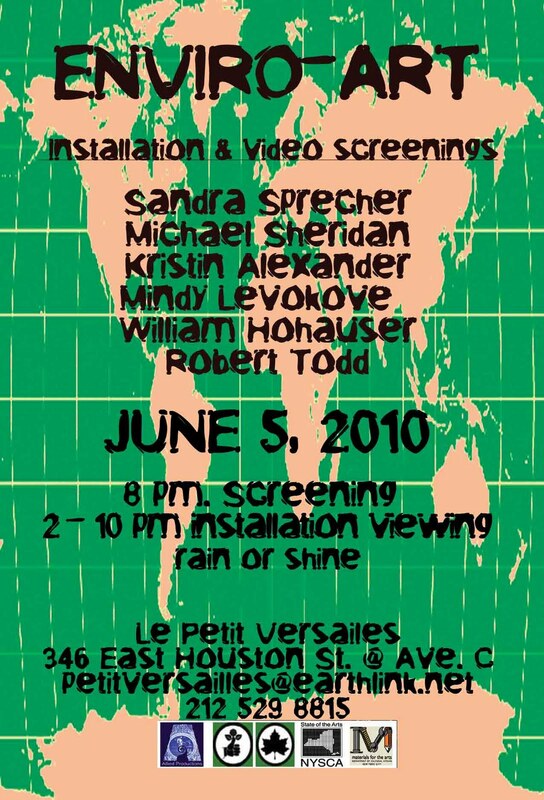 JUNE 5th — ENVIRO-ART — Film Screenings by Sandra Sprecher | Allied Productions, Inc. In the spring of 2009, I gathered together a series of filmmakers who created art/installations inspired by the environment or as commentary about the vulnerability of the environment. We had 3 showings in NYC including one at the lower east side garden. 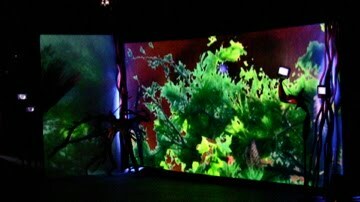 My video installation, Screaming Forest was partially funded with a NYFA grant and was originally created for a premiere at The Medicine Show Theater. This Fall it was also selected to be part of “The sustainability of the Planet-Art Gone Green” Film Screening Bunker College in Boston, MA. In addition I have made some sculptures that went with the original installation. There are small video screens that are attached to metal, found objects, pipes, scraps, etc. that I will display around the garden – Sandra Sprecher. Mindy Levokove has composed and performed vocal, electronic, and/or acoustic music pieces for theater and dance in many varied venues including The Brooklyn Museum, Tompkins Square Park and The Duke Theater. She has been a member of the bi-coastal performance group, The Amazing Landfill Gardeners of Gondwanaland for more than 12 years. She has curated and performed in Poetry and Performance Events at ABC No Rio for a number of years and at the 6th Street and Avenue B Garden for almost 20 years. She has a CD of some of her songs from before 2001, called Keys, and another CD, called CORN, to be available soon. Contact her at mlevokove@earthlink.net. Kristin Alexander is a documentary filmmaker. She studied communications and film at the University of Notre Dame and Mass College of Art. She has been a cinematographer for multiple films and video productions. Her first documentary followed 5 women surviving cancer on cape Cod, and screened in Chatham and the Woods Hole Film Festival. She has filmed and edited portraits of people around the world. Green Eco-Machine has been an official selection in the WHFF, Louisville International Festival of Film, and EcoFocus festival in Athens, Georgia.